A good representation by nearly all the formulae was probably encouraged by a beautiful summers day for this the third round of the championship. The Bilands of Le Maverick and Lakeside proved quickest in qualifying, with Special Racing Projects and the Pro Max of Auctionmyigloo, making up the second row. A clutch failure for Le Maverick prevented the pole sitters from making the grid, so after a clean start, SRP lead the field from Auctionmyigloo, but as the seven lap advantage was implemented, the Pro Kart of SRT and the World Formula team, World Thunder, now headed the leaded board. Within half an hour of the start, SRP's radiator let go, spinning them off on their own coolant and taking out a number of other competitors as they all tripped over the spillage. Simultaneously another incident occurred along with another two separate breakdowns, and for a while organised chaos reigned. As the race settled back down, the Biland brigade all suffered an array of mechanical difficulties, dropping Lakeside and No Cigar back down the pecking order to join Le Maverick and SRP. This left the Pro Max of Appliance to take up the chase to SRT and World Thunder, with the two Thunder Karts of RJB and Blue Thunder not far behind. As the half way mark approached, World Thunder had fallen by the wayside, but SRT's Pro Kart still topped the leader board from the Pro Max of Auctionmyigloo, followed by a whole string of Thunder Karts including Blue Thunder, Team Slick, Team Oblivion and Bad News. 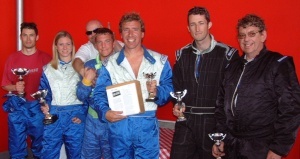 As the race progressed, the fuel efficient Thunder Karts of Blue Thunder and Team Slick relegated the Pro Max of Appliance to 3rd place, whilst the Pro Kart of SRT had slipped back to 8th place behind Team Oblivion, Auctionmyigloo and the fast finishing Thunder Karts of SAS and Red Mist. The other Thunder Kart to make a dramatic rise up the leader board in the final hour, was Bad News. Unfortunately a loose exhaust put paid to their day, as were current leaders Blue Thunder thwarted, with a throttle cable failure, which forced them back down the rankings. This left Team Oblivion in the lead, with Team Slick just behind them and gaining as the race reached its final stages. The last podium place was also being hotly contested between the Pro Max of Appliance and the Thunder Kart of Red Mist with only second between them. With the chequered flag now in sight, Team Oblivion had a small 'moment' and Team Slick took full advantage and took the win by just 1.8 seconds, whilst Appliance's Pro Max snatched the final podium place, in what turned out to be a dramatic grandstand finish.